Captain Joe Root offered no excuses as England succumbed to a miserable defeat in the first Test against the West Indies, but vowed they are capable of better. Unheralded off-spinner Roston Chase picked up a scarcely believable haul of 8-60 - the sixth best by a Caribbean bowler - as the Windies wrapped up a 381-run thrashing on day four in Bridgetown. 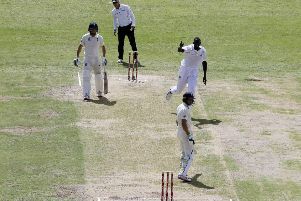 Having spent the previous 48 hours being skittled for 77 in their first innings then flogging themselves in the field as Jason Holder and Shane Dowrich put them to shame with an unbeaten stand worth 295, their muddled response to Chase’s gentle examination was merely the latest in a series of heavy blows. Root accepted his side let themselves down badly in their first outing of the year, while simultaneously calling for a big response to prove their pedigree. “It’s bitterly disappointing. We’ve had a bad week collectively and massively underperformed. We were well below par,” he said. “It’s hard to take, not because of losing but because of the way we lost. We’re a far better side than that. We’re not going to hide behind anything, it was very frustrating in the dressing room. There were some soft dismissals. “It’s disappointing but it doesn’t mean we’re out of this series and it doesn’t mean we’re a bad side. We have to bounce back very quickly. Much has been made of England’s team selection for this match, with Adil Rashid and Sam Curran both struggling to make an impact with the ball while the vastly experienced seamer Stuart Broad sat out. There is no doubt that decision would be reversed had the tourists known exactly how the surface would turn out but Root does not subscribe to the idea that it represented an easily foreseeable howler. “We went into the game with a very difficult decision to make and it would be very easy to pick that apart with the way we played,” he said. The only England batsman to emerge with any credit at all from the underwhelming 246 all out was Rory Burns, who made a Test-best of 84 before becoming Chase’s first victim. Burns’ opening partner Keaton Jennings struggled badly once again against pace and has still made only two scores of note - centuries in India and Sri Lanka. “Keaton will be disappointed by the two dismissals this week but it doesn’t mean he’s a bad player,” offered Root. Chase leapfrogged a host of West Indian favourites with his bowling figures, not least Joel Garner and Malcolm Marshall, for whom the two ends of the Kensington Oval are named. Taking the news in his stride, the 26-year-old Bajan said: “It’s always good to have your name up there with the greats, a good feeling. He was still pipped to the man-of-the-match award by skipper Holder, who added two wickets to his magnificent double hundred.